Congratulations to the photo-essay contest winners! The authors of the winning essays printed below correctly identified the two brothers in the photograph in the Academy of Music lobby as George and Ira Gershwin. Claire Connelly, age 9; Manny Hernandez, age 11; Alicia Mose, age 11; and Sian Carr, age 14 will each win an Academy of Music hooded sweatshirt. George and Ira Gershwin were two 20th-century composers who helped bring ragtime, blues, and jazz music into the spotlights in America. Ira Gershwin was born December 6, 1896. His brother George followed on September 26, 1898. They both lived in Brooklyn, New York. As a child, George Gershwin was mostly interested in being the roller-skating champion in his neighborhood, and he didn’t care much for music until he was a teenager. Then he heard a fellow student, Max Rosen, play his violin. George was fascinated with the music, and he and Max became good friends. When Ira was a teenager, his parents managed to buy him a piano so that he could take lessons. George and Ira began playing popular tunes and making their own melodies. Later on in life, George studied composition with Rubin Goldmark. Soon George and Ira were composing their own compositions–George wrote the tunes, and Ira wrote the lyrics. They became a great song-writing team. They were so talented that at one time George had a yearly income of $100,000! Before long they were writing the popular music that many of us are familiar with today, such as “Swanee” (selling millions of copies) and “Rhapsody in Blue” (receiving a thunderous standing ovation after its first performance). “Someone to Watch Over Me”, “I Got Rhythm”, and “Strike Up the Band” were soon written for Hollywood and Broadway. The musical Of Thee I Sing was the first to win the Pulitzer Prize in drama. Some more of their serious works were Piano Concerto in F, An American in Paris, Preludes for Piano, and the opera Porgy and Bess. This opera was first performed in 1935, and it has become very popular all across America. Soon after the first season of Porgy and Bess, George became ill. He died at the early age of 39 of a brain hemorrhage in 1937. After his brother’s death, Ira retired from songwriting for a little while, but he began writing again in 1941. He wrote Lady in the Dark with Kurt Weill, which was a success, but his last two shows were failures: The Firebrand of Florence and Park Avenue. He lived to see another Gershwin hit, though: My One and Only. Ira Gershwin was often in his brother’s shadow, but after his death in 1983, he was recognized as one of the greatest American lyricists ever. He had lived to be 87 years old. George and Ira Gershwin were truly talented in writing ragtime, blues, and jazz. They gave the music jazzy beats that reflected the spirit of America, and they put in harmonic and melodic qualities that very few had tried to add in before. Musicians across the surface of the earth were inspired by their unique ability to create a serious musical art out of American popular music. The Gershwin brothers also had the talent to combine the classical style of music with modern-day jazz and blues. Many of the musicians of today might not have been playing jazz, blues, or ragtime in the correct way with the right kind of beat if they had not played “Swanee”, “Rhapsody in Blue”, or other Gershwin pieces. Gershwin music is truly amazing. Take a deep breath, look at the music, begin to play, and let your fingers fly. The two gentlemen in the picture are George and Ira Gershwin. Isereal Gershovitz (Ira Gershwin) was born December sixth in 1896. Jacob Gershovitz (George Gershwin) was born September 26, 1898. They both were born in New York. George Gershwin passed away from a brain tumor in 1937 in Los Angeles, California. Ira Gershwin passed away peacefully in 1983 in Beverly Hills, California. George and Ira Gershwin are important to music because they wrote many great songs. They are known for writing songs on their own and together. Their music was in the style of Jazz and was created for Broadway and Hollywood. They are also well known for their funny musical songs. Also, their work helped make the theater more popular. Musicians today still enjoy their music. The two men in question are the Gershwin brothers, George (September 26, 1898 – July 11, 1937), and Ira (December 6, 1896 – August 17, 1983). They both were born in New York, in some part of New York City, but later moved around to their tastes. George went to Paris for a short period of time, but then returned to the United States. He traveled around, performing music, or having others do so, until one day, after suffering from a type of brain cancer, collapsed in Hollywood, dying a short while later. Ira stayed longer in the United States. Unlike his brother, he completed high school, afterward working as a cashier at his father’s store. He remained in the United States for just about all of his life, following where his music could be sold. He too died in California, but in Beverly Hills. The brothers did work together at one point in time, each with very different talents. George was the composer. He wrote many pieces for piano, as well as for orchestra. Some of his most famous pieces were: Rhapsody in Blue (Piano, Orchestra), An American in Paris, and his most ambitious piece, Porgy and Bess. Ira however was a lyricist, and rather a brilliant one at that. He got a later start to his music career than his brother, but succeeded just as much as his brother, with the inescapable failures along the way. Ira wrote multiple Broadway shows, including songs such as I Got Rhythm, Embraceable You, The man I Love, and Someone to Watch Over Me. Together with his brother, he wrote the Opera, Porgy and Bess. I suppose what I’m getting at is that the Gershwin Brothers were both wonderfully talented people who provided a huge amount of music for later generations, many of this not classical, but more of a jazz genre. They worked together and separately, bringing both of the talents together for wonderful masterpieces, and then with others, spreading the style around. George Gershwin was an American composer whose works of art are still remembered today. He was born in 1898 in New York City to immigrant parents from Russian and had had three siblings. He was first interested in music at age six when he listened to a recording of piano music. At a young age, George’s parent’s brought a piano into the house for his older brother Ira. At the age of 9 or 10 George heard a violinist play and thought that he wanted to play an instrument too. Through his natural musical talent, George went from poverty to riches. Gershwin grew up in a poor part of New York City with other immigrants. This was a time in American when many people were moving to American to be relieved of the poverty of their home country. Instead of staying inside, like his older brother Ira, George liked to get into fighting competitions with other boys. Ira is pictured with George in the picture. One time George got hit so hard that he had a scar on the top of his forehead for his whole life. After this fight, George started to play on his friend’s piano rather that spend his time roughhousing with the other boys of the neighborhood. Soon George wanted to spend all of his spare time playing the piano and dreamed of a life as a musician. When George’s parents found out about his natural talents, they found a very good teacher named Charles Hambitzer. Mr. Hambitzer taught George the proper way to play. George started taking lessons at the age of 12 and he caught on quickly. At the age of 15 George left school, even though this worried his mother, because he wanted to find a job as a musician. A man named Remick gave George a job in Tim Pan Alley to play twentieth century style music to customers making $15 a week. A famous dancer named Fred Astaire would regularly listen to music in Tim Pan Alley and especially like Gershwin’s music. Eventually Gershwin and Astaire became good friends. In George’s spare time he composed his own music and played it in Tim Pan Alley. Gershwin’s first published song was not a great hit and was not well liked, but later that same year Sigmund Romberg used another one of Gershwin’s songs in one of his popular shows. After this time Geroge’s fame grew across the country. George’s first finished and published musical score was called La, La, Lucille. This musical was a big hit. One of his most popular pieces was a song called Rhapsody in Blue. After World War I America fell into the Great Depression. Gershwin was not personally affected by this because his popularity was growing. He wrote cheery songs and he tried to make people forget theri troubles for awhile. George wanted to spice things up a little bit, so he composed short jazz operas which which became the next type of American music. George teamed up with a man named Paul Whiteman and together they composed a jazz opera called Blue Monday. By writing more lively tumes George inspired future composers. When George was not in his office, he liked to play many sports and other activities. His favorite sport was golf. One time he hit the ball through a window. Another thing George liked to do was deep sea diving. Gershwin liked the outdoors and remained fit. When the weather was bad, he liked to paint portraits of his friends. In the last 6 months of his life in 1937, his health went bad quickly. George was playing the piano at a concert February 1937 when all the sudden he blacked out. Doctors examined him but they could not find anything. He started having bad headaches. On July 9th, he fell into a coma. Gershwin died two days later on July 11 from a brain tumor. The new of his death shocked and saddened the public for many years. My wife & I listened live from our home in the village of Outwell, Norfolk, England & we would like to thank all concerned for an incredible performance, so very professional. Isn’t it amazing that Daphne & I could sit here in England listening to the live concert in Appleton. We listened in to the recorded Pre-Concert too & it was nice to hear a couple of English Folk Songs, I Had a Little Nut Tree & She Shall Have Music. We learned them at school a lonnnnnnnnnng time ago. Our friend’s daughter, Mackenzie Harrmann, was performing in Bel Canto which was the reason we had ‘tuned in.’ Thank you for making us a part of it & we’re now off to bed as it’s 02.40 in the morning. miss yet another event in my child’s life. Thank you so much. Thank you so much for the broadcast of the Lawrence Girls Choir Concert tonight. We attend when we can – but right now we are in Florida and we could enjoy hearing our granddaughter sing thanks to you! Thank you! It was great. We followed along in the program notes so no commentary was needed. Thanks again. 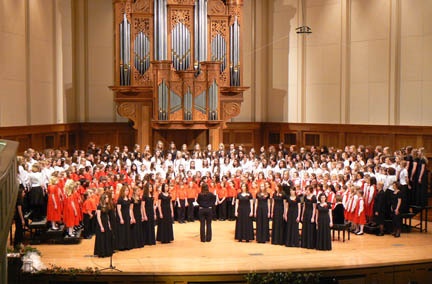 Congratulations all on another banner year providing quality choral opportunities for girls in the Fox Valley region. Auditions for next year are happening soon. Check the Academy website for audition registration details: www.lawrence.edu/dept/acad_music.